BLU, a US-based company best known for launching a wide variety of affordable Android handsets, today announced the Pure XL, a high-end smartphone that's going to be available starting September 29, exclusively via Amazon. 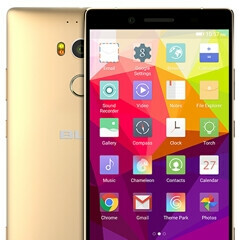 The BLU Pure XL is the company's most advanced handset to date. Running Android 5.1 Lollipop, the device sports a 6-inch Super AMOLED Quad HD (1440 x 2560 pixels) display, and is powered by a 64-bit, octa-core MediaTek Helio X10 processor clocked at 2.0 GHz. According to BLU, the Pure XL is the first Helio X10-based smartphone made for the US market. A highlight of the new smartphone is its 24 MP rear camera, which is protected by sapphire glass, and features phase detection auto focus, optical image stabilization, and a dual-tone LED flash (of course, we'll have to test this camera in order to see if it's any good). On the front, the Pure XL has an 8 MP camera. The handset's other features include a fingerprint scanner on the back, LTE connectivity (compatible with AT&T and T-Mobile), 3 GB of RAM, 64 GB of expandable storage space, and a 3500 mAh battery. BLU will sell the Pure XL unlocked, for $349, making it the cheapest Quad HD smartphone in the US (at least when we take into consideration prices at launch). Is anyone intrigued by this affordable Quad HD handset? Now All The Need Is A 5in 1080p Device With The Same Specs For $300. I Don't Think Many People Are Looking For A Device With A 6in Display Are They? For such a list of features and for this price, I am pretty sure many won't be bothered by the fact that it has a 6" screen, a QHD one. For me, only a 6" would do, 5.5" is the minimum, a compromises as there is no lack of large screen phones. My eyesight is not getting better. Interesting. A $350 devices with a QHD+ 6 inch screen, fingerprint scanner, nice camera, and fast chipset. Still too big of a device. ... This is truly amazing honestly. I really want to test it out in person. I can guarantee you that you're not in the minority. The fact that all flagships are going giant means the market research shows that's the trend. We just have a very vocal minority here on Phone Arena that love smaller phones. How is that possible? I thought I saw Gionee was asking US$700 for the Elife E8. I would definitely scoop this right up! I thought Super AMOLED was reserved only for Samsung devices? I know it's just branding, but still. I am not sure if it is a Samsung panel, but Samsung does produce amoled panels for other OEMs. Plus there other amoled screens makers. Latest news is that Huawei will get flexible amoled panels from Samsung for it's upcoming dual edged phone. I would consider it if it ran Windows 10 Mobile. I want some large screen Universal Windows Apps and Continuum for phone. Since it runs Android, I will just keep using my Nexus 5. Want a 6" display that looks fantastic? A camera with REAL 20MP capabilities and for less than $300? Get a Lumia 1520. But it's 10 years old with sd 800. But it still kicks the crap out of this BLU. A Nokia 808 is 20 years old and kicks the crap out of any smartphone camera. I'm 50 and I'll let any 20 year-old try his game on me. Old doesn't mean ineffective or weak. Other forums are suggesting that it does. NFC is going to be pretty important with payment systems, so not having it is pretty inexcusable for flagships. I'll get one just for navigation for my car and tuning my quadcopter fpv racing.. nice.. so cheap.. iphone 6S plus and sony Z5 premium and this will be my new toys as soon as they come out.. I'll get one for my 3yo son, so he could stop playing with my edge plus and note 5. Does this require ingestion of either eye of newt or toe of frog? This really packs a punch. I think I would take the ZTE Axon over this though, but I'll wait for the reviews. You can be sure that this phone will get good reviews. But what about resale? Both ZTE and Huawei have been sold by Carriers. Sony M4 Aqua in white is my choice, waterproof like Sam Active, Sony camera, Snap 615 with 64bit OK with me. 720p help battery. Sony much bigger ten Blue! Many reviews saying Quad HD is for Flagship Status, publicity, but companies release same phone in series with lower screen resolution afterwards. Also, Android competition in India driving designs. Right now we have Quad HD, Sony Xperia Z5 Ultra was just released with Z5 Ultra, Z5 and Z5c have lower Res., but all coming in March??? Blue Ray took years to become common, people were happy with DVD! Quad HD just eats battery. If camera is important why not try a Sony, if you are going for a non-carrier, unlocked phone. Pixels are not only part of the camera that determines best functions. Huawei and ZTE are both big in China. Asus phones are fromanother well established company!